This just in………at long last, women can be just like men. Technology, ya gotta love it. The latest in footwear creates a level playing field for women when it comes to a sense of direction. 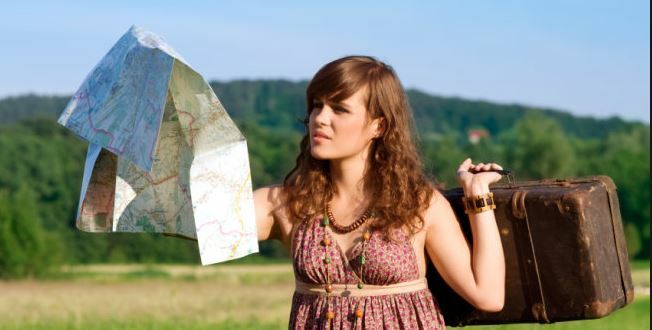 For eons, men have been far advanced over women in finding their way around the world without ever having to ask for directions. Safe to say, no man was ever lost, he just occasionally took a bit longer to get somewhere. For those same eons, before the advent of GPS, women have willingly relied on directions from complicated charts and maps or worse yet, complete strangers; this merely to get from a simple point A to a ridiculously manageable point B. In fact, even with a dependable man in the car with the inherent, infallible directional capabilities of a purebred bloodhound, a woman would favor a map, which was probably outdated, over the natural instincts of the male of the species. Enter, Lechal shoes, the Blue-tooth enabled footwear that will synchronize with your smart phone and vibrate to tell you when and where to turn as you are trying to find a new destination. Yes, capitalizing on Google maps for phones, combined with women’s complete trust in vibrating devices, the manufacturer has developed a software system which cues the right or left shoe to vibrate to head you in the right direction as you plod along. Now women will enjoy the same freedom men have relished since time began; taking trips with no compunction for wrong turns. This entry was posted in "This just in...." and tagged asking directions, digital shoes, GPS. Bookmark the permalink. 19 Responses to This just in………at long last, women can be just like men. Do they do them in heels? Personally, I like exploring the unbeaten path. I use GPS to make sure I can find my way home after a backroad detour. I think we would be good travelers together. Don’t lump me into your data gory of wimmen…please! That’s category, but data gory works too! Should have exempted a world traveler like yourself. My bad. I think I’ll stick to my maps for the moment…. I read them before I leave home and list the main turning points. No time for GPS, I managed to find my way on the roads for 50 years without it………………………… Where am I? You missed your calling….you should have been a cartographer. Just when you think you’ve seen everything…. Gives a whole new meaning to “walk a mile in his moccasins” eh? Methinks that you are treading on dangerous ground. A wise man knows when to give directions and take directions. A wise women knows when to give directions and when to take directions. sadly, both men and women are seldom wise at the same time ! Yes, this kind of goes along with the adage “There are two sides to every argument, the man’s side and the correct side”. I am so buying these shoes! But I think I would like to have a different color. I figured you and PK would be the first two customers.